The Ristorante San Desiderio of Siena is located in the centre of the city, close to both the Piazza del Campo and the Cathedral, inside an ancient deconsecrated Romanesque church. The San Desiderio menu is linked to the seasons, and includes truffles, mushrooms and wild boar, together with some other specialities. 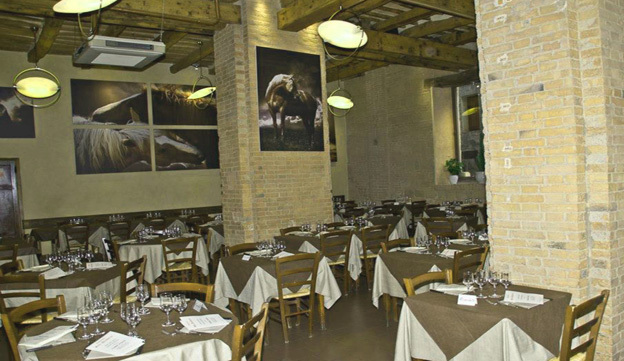 Here you will find the true chianina steak, but also fish dishes, which are always fresh, and delicacies such as ‘bottarga’ (fish eggs) imported directly from Sardinia. The menu also includes interesting dishes which reinterpret, in a measured way, the classics of Tuscan cuisine. The presentation of the food is particularly good, such as to satisfy your eye as much as your appetite. All the dishes are freshly prepared and the atmosphere of the restaurant encourages the tasting of food without a rush. The desserts are all homemade. Perfect for tranquil and romantic dinners, but also appropriate for a fast yet relaxed lunch, San Desiderio can offer its specialities to larger groups, thanks to its spacious interior. During the summer, you can also enjoy San Desiderio’s dishes outside in the little square in front of the restaurant.